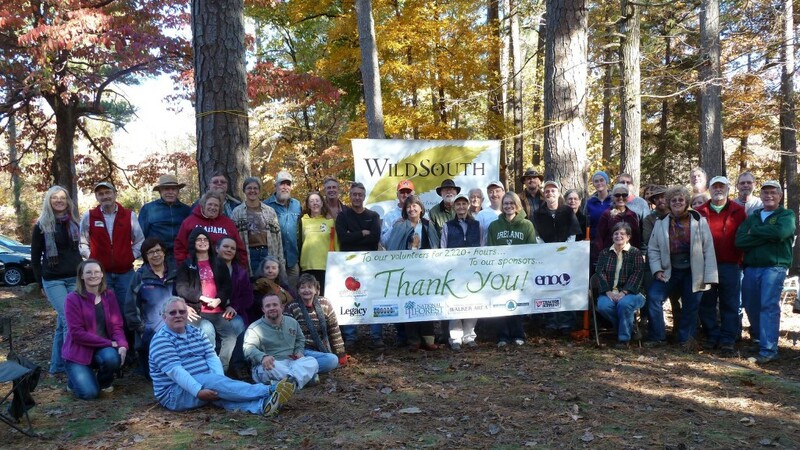 Open to anyone who’s ever volunteered with Wild South or has donated to Wild South or is interested in becoming a Wild South volunteer. Come as early as you like. Lunch at 1:00 p.m.
You are also welcome to bring your family or a friend, your kayak, canoe, yard games, musical instruments and hammock. There are lots of big trees at our picnic site which are great for hammock hanging. Wayne says he welcomes pickers to jam with so bring whatever you play and plan be part of the entertainment! Bring a chair or something to sit upon. We will provide CHILI, grilled hotdogs, hamburgers, condiments and drinks. Please plan to come and enjoy socializing with your fellow forest-lovers in a beautiful place! There will be good food, a drawing for prizes, special gifts and, of course, the announcement of this year’s Premier Volunteer! We will gather up for lunch at 1:00, but come as early as you like to hike the trail, fish from the pier, or float on the lake.